The broken pipe that cut off water to thousands of New Plymouth residents was made from asbestos cement, it has been revealed. Officials say the asbestos posed no health risk but the New Plymouth District Council has failed to answer questions about what happened and why the public was not informed what the pipe was made of. 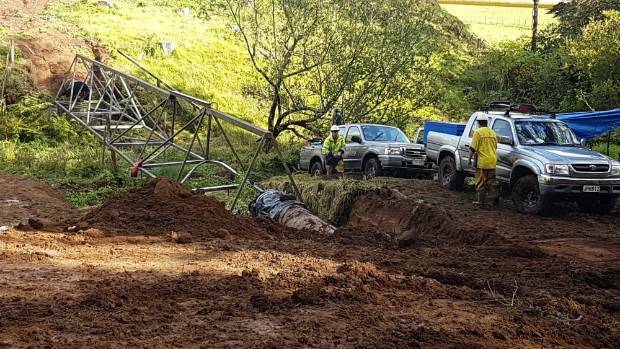 NPDC spokesperson Jacqueline Baker said in a statement the pipe which was smashed by a tree during ex-Cylcone Gita was made of asbestos cement. The broken main water supply pipe near Hydro Rd, north of New Plymouth was an asbestos cement pipe, but the health risk is minimal. "We worked closely with independent health officials during this weather event and are confident no asbestos material entered the water network," she said. That was the entire answer provided by the NPDC when asked about the health risk to the public and contractors who worked on the pipe; whether any asbestos had made it into the water supply; what the removal process was and whether the contractors were licensed to remove asbestos; how the pipe was disposed of; why the public was not informed; if the water had been tested for asbestos and whether there was a plan to replace the rest of the district's asbestos pipes. The pipe was cut in half by a tree on Tuesday February 21 during ex-cyclone Gita and stopped the flow of water from the water treatment plant to homes and businesses on the eastern side of New Plymouth and surrounding towns. It was fixed two days later but the boil water notice continued until it was lifted on Friday - a week later. Taranaki Civil Defence Emergency group controller Brent Manning said in his view there was no need for NPDC to inform the public. "As far as I'm aware there's no risk around them," he said. He said asbestos cement pipes like one that was smashed were known as brittle pipes, and Christchurch had a lot of them which caused problems in the earthquakes. Baker said in a separate statement that about a quarter of New Plymouth's 800-kilometre water network is asbestos cement (AC) pipes. "We have about 200 kilometres of asbestos cement pipes in our water network which are regularly tested and this product was historically and commonly used for water networks across New Zealand," she said. "Our water network is made up of pipes ranging from nearly new, to 100 years old. It's a complex system with more than 800 kilometres of pipe and 17 reservoirs." The pipe was supported by a pipe bridge made of concrete and steel, and the broken AC pipe has been replaced with a concrete-lined steel pipe. According to Water New Zealand's National Asbestos Cement Pressure Pipe Manual released in February 2017, AC pipes were an integral part of infrastructure in New Zealand until 1986 when they were no longer manufactured and installed. While airborne asbestos fibres have been associated with asbestosis and cancer, the risk associated with asbestos in water is extremely low, says Water New Zealand CEO John Pfahlert. "In respect of asbestos cement pipes the one problem in terms of people's health is if they get dry, so as long as they're in the ground and there's water flowing through them there's very little risk," he said. He said it would be more of a risk to the contractors who had to deal with the damaged pipe due to the airborne particles, but wet particles that are swallowed pose very little risk. He said about a third of all pipes in New Zealand were AC pipes. "Councils are working on repairs and maintenance to AC pipes every day of the week in every district council in New Zealand, so it's very very common." "If it's just an ordinary AC pipe that's been in the ground they often have a layer of bio film on the inside of the pipe anyway which tends to prevent the particles coming through." He said increasingly if an AC pipe needed replacing, it was left in the ground to minimise risk and the new pipe was placed either in the same trench or on the inside of the old pipe, if the smaller diameter was not a problem. "That's just a good work health and safety practice."